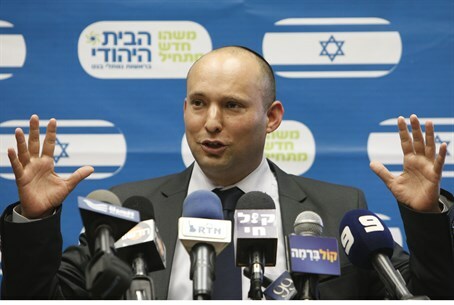 Surprising figures show religious-Zionist party's popularity among secular and younger voters skyrocketing. A poll shows that over 71% of expected Bayit Yehudi (the "Jewish Home" party) voters do not consider themselves religiously observant. This is a surprising finding for a party that is a successor to the decades-old, now-defunct National Religious Party. The poll, conducted by famous Israeli pollster Mina Tzemach, found that only 28.3% of those who plan to vote for the Jewish Home, consider themselves religious; over 18% consider themselves secular, and 53.4% are "traditional." This should be an eye-opener for many outspoken party leaders and members, whose 77,000-strong membership will choose the party's list of candidates in primaries tomorrow. Though the list will contain 3-4 members of Tekumah, considered the more "Torah-based" faction of the Jewish Home list, candidates for the other spots include some candidates whose views on religious legislation are relatively liberal. MK Ayelet Shaked is a puzzle to many party analysts in this regard. A co-founder of the party together with Naftali Bennett and Rabbi Avi Ronsky, she is not religiously observant in her private life. However, she has been warmly endorsed by figures such as Rabbi Chaim Druckman, and is said to have done more for yeshivot and other religious-Zionist causes than many others of her party colleagues. She is widely expected to garner the top spot, after Bennett, in tomorrow's primaries. The Tzemach poll also shows that among 18-24-year-old voters, a full 27.4% plan to vote for the Jewish Home – the equivalent of almost 33 Knesset seats among that age group. Among those aged 25 to 34, nearly the same amount – 26.5% - plan to vote for the Jewish Home. Among the candidates in tomorrow's party primaries are 11 women – seven of whom are guaranteed to make the top 20, according to the party's current election rules – as well as five journalists, five rabbis, one Druze, and one Arab.